It is easy to find many descriptions of what MVC is - for instance here, here or in this video. I'm curious, what is NOT MVC? 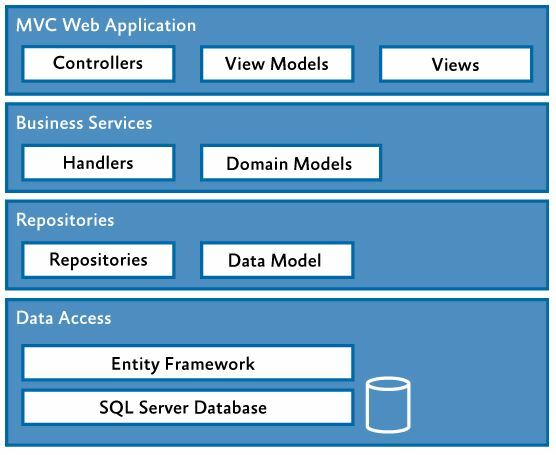 or more precisely - In a MVC-using app, what is everything else apart form MVC? Which seems to suggest that you should try to fit in as much as you can (or all) of your design under either Model, View or Controller. Yet, it's easy to see that in most explenations MVC is primarily described as a user interface design. How in this situation do I treat non-UI elements? Do I bend definitions of non-UI elements and try to figure out whether they could fit to either Model or Controller? Is there a separete description in MVC design that deals with non-UI elements? Is there a description of how MVC interacts with such elements? Is it all through Model? All through Controller? I'm wondering how do I treat the part of my application which is used only for monitoring my local network and storing the information in a database. It has no UI related functionality and its sole puprose is to fill in the database with file related information, which then in turn is presented to the user through the web interface. I'm wondering how do I treat the part of my application which is used only for monitoring my local network and storing the information in a database. Several architectures implement such code differently, but in a layered architecture, you would need to create layers, e.g. DataAccess layer, Business logic layer. etc.. Your Model (there are different types of models) will interact with these layers as required, it all depends on your application or software architecture really. Do I bend definitions of non-UI elements and try to figure out whether they could fit to either Model or Controller ? I would say your "non-UI elements" is actually your business logic that needs to go in Model which then can interact with different layers e.g. DB layer etc.. The Model, which represents the information which is to be displayed, but which is completely agnostic of how the information is presented. The View, which displays the information in the model, but which has no idea about how the model has been built. In theory, and often in practice, the same model can be connected to multiple views – the appropriate view depending on the scenario (e.g. Mobile browsers vs Desktop, or html vs json). And the same view can be used to display many different models, provided the models have enough in common with each other for that to be useful. In NOT MVC applications, these three systems are not kept separate from each other (common in older applications) or are divided up in different ways. The MVC application can have many other components in it too. These components may be used in constructing the models, updating the data layer, enforcing security, logging, whatever else your application needs. Not the answer you're looking for? Browse other questions tagged design design-patterns web-development web-applications mvc or ask your own question. Is this an MVC framework?